A major artistic showcase inspired by China opens at the University of Stirling this Sunday, 20 September. 'Reflections of the East' is a series of exhibitions and events presented by the University's Art Collection and will run until 23 December. Over 70 works, spanning ink paintings, sculpture and glass are included in solo shows by Kate Downie, Fanny Lam Christie and Emma Scott-Smith, who share a creative relationship with China. 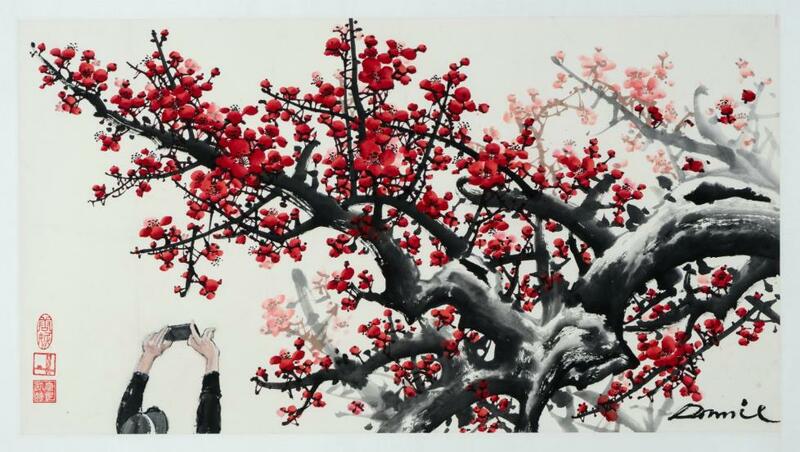 A painting by Chinese oil painter and curator Ding Fang will be exhibited. Archive items from the late Stirling-born filmmaker Norman McLaren's travels to China - during the communist revolution - will also be displayed. 'Reflections of the East' is part funded by Museums Galleries Scotland and is open to members of the public in the Pathfoot Building. Kate Downie first visited China five years ago on a Royal Scottish Academy scholarship. On 11 November she co-presents an Ink Painting workshop and will also deliver the Art Collection Autumn Lecture ‘Future-proof’: A European gaze at new traditions and past inventions in China. Emma Scott-Smith, a University of Stirling lecturer in Health Psychology and MPhil Psychology graduate of the University, is on the Board of Trustees of Reachout with Arts in Mind in Alloa, a mental health and arts disability group. Emma, who exhibited in Tianjin in 2013, will be holding an art workshop for Reachout in the Art Collection as part of the programme of events. Originally from Hong Kong, Fanny Lam Christie has been working as artist in residence at the University's Institute of Aquaculture in 2014/15. The programme also includes a tea ceremony and screenings of films by Jia Zhangke - introduced by Stirling's Dr Phillipa Lovatt - at the Macrobert Arts Centre. Jane Cameron, Art Curator at the University of Stirling, said: "This programme hosted by the Art Collection aims to build on the University’s vision to value and embrace international experiences, histories and culture and celebrate the diversity of our student population. We are delighted to be hosting a diverse programme of exhibitions, lectures and events providing a fascinating glimpse of the Far East." Find out more about Reflections of the East. The Norman McLaren archive is held by the University of Stirling. Fanny Lam Christie's exhibition 'Aquacultural Encounters', following her artist residency at the Institute of Aquaculture, was supported by Creative Scotland.